Second in the "Tripod" trilogy, this book picks up where "The White Mountains" leaves off. Will and his two friends, Henry and Beanpole, have found a group of free humans in the Swiss Alps (the white mountains). They have successfully avoided the mind-control of the Tripods, and are living by their wits and plotting overthrow of the aliens. Control of humans is achieved by "capping", putting a metal cap on the head of every 14 year old and giving orders thru the cap to the human. The free humans have avoided being capped by different methods. No living Tripod has ever been seen or studied, so a plan is devised to get some of the uncapped humans into the cities that the Tripods live in. It is known that every year the best and brightest of the young humans who have been capped are sent to the cities where the Tripods live. Will and a fellow resistance-fighter, Fritz, win in the games and are selected to be taken into the city to serve "the Masters". Will discovers that the Tripods are actually mechanical devices like cars that are needed to carry the Masters outside of their cities. 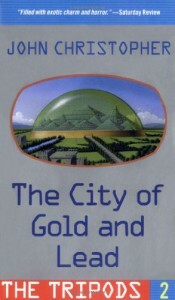 They cannot breathe Earth air, so they have created cities that are totally enclosed and have recreated the heavier gravity and green poisonous air that they breathe on their home planet. Will and Fritz become slaves to different Masters. They wear special scuba type breathing apparatus so that they can walk and work in the atmosphere of the Masters. The grindingly heavy gravity wears them down, and they both realize that the young people brought in as slaves age and die in 1 to 2 years because of the very harsh working condition, as well as the beatings and tortures that they sometimes endure at the hands of the Masters.Will and Fritz successfully find out information about the Masters, the three cities they have established on Earth, and the plot the Masters have to eradicate all humans and change the planet atmosphere of Earth to support them. Will successfully breaks out of the city by going through the river that dumps into a river outside of the walled city, and eventually makes it back to the White Mountains to report.